One of the first verses in the Bible about the poor is tied to the issue of debt. God did not want his people taking advantage of a poor man by charging excessive interest. Oh wait, check that…they were to charge the poor no interest at all. Loaning the money was fine, but the lender was not to expect anything back other than the original loan amount. God stated this command again in Leviticus 25:36-37. Here we see God providing a way for the poor to find food. He instructed the farmers to not pick every single grape from their grapevine. Instead, they were to leave a few behind so the poor could come in after the workers had left and glean from the leftovers. By using the phrase “falls into” the Bible here seems to be addressing accidental poverty. Sometimes a life event could happen that might cause someone to become poor. (See the story of Job in the Bible.) Maybe it was their fault but maybe it wasn’t. Either way, God instructs his people to not reject those who become poor. Instead reach out to support them. Perhaps even provide a place for them to live for awhile as they get back on their feet. 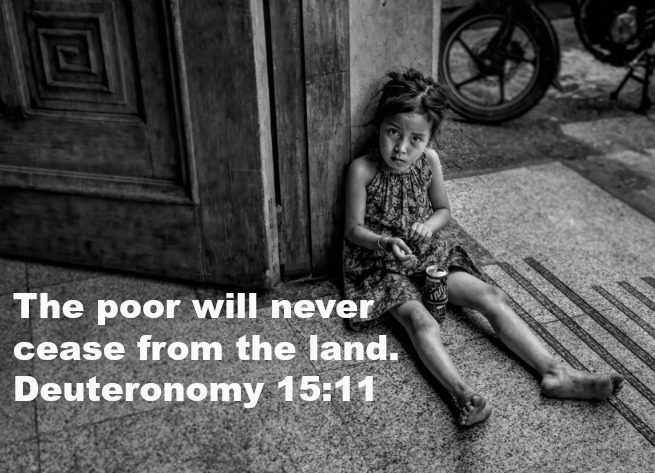 Perhaps no other series of verses in the Bible so clearly illustrates and describes the nature of our heart attitude toward the poor as these in Deuteronomy. We are called to be sensitive to their situation and are challenged to not harden our heart to them. That sensitivity leads to a giving spirit…and not just any giving spirit. It’s a beautiful picture the Bible paints of our hands being open wide, signifying a generous spirit of giving to their need. This addresses employers who might be tempted to withhold payment to their employees for work rendered. The poor of the day counted on receiving a day’s wage for whatever work they performed. They “set [their] heart on it.” They needed it to survive. God says the employer has no right to withhold it from them even for a day. The poor feel they have been forgotten – that no one is remembering their plight. But God does remember. He offers encouragement and hope that He will see their situation in time. The word reproach means to address someone in such a way as to express disapproval or disappointment. Synonyms could be “reprimand,” “rebuke,” or “chide.” Do we really want to go there with God by oppressing the poor? He is the “Maker” the verse references. Are we so arrogant that we think God made a mistake when he created the poor? I don’t think so. They are equally loved beings worthy of respect and honor. Many times people take advantage of the poor simply because they can. The poor have less access to resources, knowledge, and information about how things are supposed to work. Consequently, that information deficiency (and situational experience) create opportunities for those in-the-know to exploit the poor for money or whatever else they need. Needless to say, God does not look kindly on those who do this. The prophet Isaiah gives us a glimpse into the future in this prophecy about the coming Messiah – Jesus Christ. Jesus would quote this passage (see Luke 4:16-22) at the outset of his ministry while preaching in the synagogue in his hometown. The words that followed his recitation launched his ministry as he said to the gathered audience, “Today this Scripture is fulfilled in your hearing.” Some didn’t like that boldness. However, Jesus clearly defined his mission – which included speaking to and interacting with the poor. Zechariah challenges us to not oppress widows, orphans, strangers and the poor. Do not direct an evil thought toward those who feel like outcasts and are alone because of some a life altering event. This passage comes from an encounter Jesus had with a rich young ruler. The big idea message isn’t so much about helping the poor. Rather it is what are the personal issues that come between us God. For the rich man it was his great wealth. He couldn’t let it go even to help the needy and, in the end, it cost him a special opportunity. After the church began the apostles faced persecution, trials and interestingly enough doctrinal issues. One of the biggest controversies was whether or not the new believers in Christ (some of whom were Gentiles) had to convert to Judaism and practice certain Jewish rituals. The apostle Paul didn’t believe conversion to Judaism was necessary for salvation. The church leaders at large eventually reached the same conclusion. They commissioned Paul to preach the message of salvation and in doing so remember the poor. Paul tells us here in Galatians it was always his desire to do so. If it was important to Jesus and Paul it should be important to us. Finally, these verses in James address the subject of showing favoritism to the wealthy over the poor. James says it’s wrong to place the wealthy in special places of honor and subject the poor to lower places of honor. We should treat everyone equally. Interestingly enough, the Bible also says that favoritism going in the direction of the poor over the wealthy is wrong. Exodus 23:3 says, “You shall not show partiality to a poor man in his dispute.” Leviticus 19:15 also addresses this issue by saying, “You shall do no injustice in judgment. You shall not be partial to the poor, nor honor the person of the mighty. In righteousness you shall judge your neighbor.” So don’t show favoritism in either direction – to the poor or to the wealthy. Questions: What verses stand out to you? Why do you think God has such a special place in his heart for the poor? What are you doing to reach out to the poor in your neighborhood or around the world? What other Bible verses about helping the poor can you think of? Thank you for this great article. It is a necessary review for some, and mind-numbing glimpse of reality for others. One of the greatest complaints the God of Israel had against those he had of former days appointed to be His own people, was how they treated the poor, the needy, the strangers and aliens in their midst. Many who claim to be Jesus’ disciples must pull their heads out of the 21st century and allow God to train them to think with their renewing mind as citizens of the Kingdom of God. You cannot sell the poor for a pair of sandals and claim to have your feet shod with the preparation of the Gospel of peace. Very nice message , there is a village somewhere in Africa beds for patients are not enough , i saw pregnant women sleeping down more than 10 ,I pray someone will see this and do something. God bless you all and lets pray that there is peace in the world . I think that Good says he made us in his imagine. That means every race, of every country not just your own. So that said I believe God is talking about all people who are poor, should receive our help. Not just your Town City or State or your country. This is what I take from the Bible. I think that God says he made us in his imagine. That means every race, of every country not just your own. So that said I believe God is talking about all people who are poor, should receive our help. Not just your Town City or State or your country. This is what I take from the Bible. I agree a whole lot with Sherry Taylor. The terms used in this parable are clear. “Good Shepherd” is matched by “sheep” which is referring to Christ and his followers. Goats are non believers. Additionally, verse 40 refers to “brothers of mine.” Here, Christ refers to those of us who became like family members, by choosing to follow him, as we are one in Christ Jesus. The “least of these” is not referring to those who are outside the flock, but refers to our brothers and sisters in Christ who need help, are sick, need prayer, comfort, need a meal, etc. The Goats in Jesus’ parable cannot be “non-believers” in the Modern sense; unless you equally would think all Americans are Christians. We must be careful not to twist what Jesus says to match our own biases, bigotry, and sub-cultural traditions. The Goats in question could not have been not pagans or Gentiles, nor despised Samaritans, Moabites, etc. Jesus himself told certain Jews (convinced they were the children of God) that their “father” was not Abraham as they claimed but rather was the Devil. Jesus even said there were sheep who not of “this fold” whom he would gather altogether into one flock. Now, everyone is perfectly free to say, teach or preach anything they want to according to their own perfect wisdom and knowledge. But be very, very cautious when you claim “Thus saith the Lord” that actually the Lord truly saith such. Okay? Hi mates, its great paragraph regarding cultureand entirely defined, keep it up all the time. All these verses from the scriptures arte very useful. Try to explore and keep some more relevant verses. Oh, what God wrote isn’t useful? You need help. Thanks for this great post. I think we get wrapped up in our own financial issues sometimes that we forget that we should be helping others. You are welcome Tre. There is definitely more to life that what we are going through. I like the Psalm 41:1. I always try to reach out to the poor as much as I can and if there’s an opportunity to help them, I don’t think twice and am glad that I can help them even with smallest things because they are appreciative. I love this verse “Blessed is he who considers the poor; The Lord will deliver him in time of trouble.” I am not necessarily helping the poor but I am definitely serving a group with minimal to little wealth and I think about verses like this because I know it’s what I’m called to do. I have made less helping others with less, but I always feel taken care of because I know I am doing the work that I am meant to do. That’s great perspective Shannon. No doubt the people you are serving are very appreciative of what you are doing for them. Excellent post and list. These are things we need to remember throughout the whole year, not just during the holiday season. “…remember throughout the whole year…” That’s true Cat…we need better consistency. It seems like we get really focused on it around the holidays and forget about it the rest of the year. The Word of God is filled with a scriptures teaching us how to treat the less fortunate among us. That is why I do no understand the philosophy of many in the Republican party. The poor are vilified and whenever they are looking to save money it is from programs that help the children, poor and elderly. I think it is high time Congress reads and obeys the Bible. We cannot merely say we are believers. We have to walk the walk. Luke 6:46 – Why do you call me, ‘Lord, Lord,’ and do not do what I say? “…whenever they are looking to save money it is from programs that help the children, poor and elderly.” I can understand why that seems like it’s the case. On the other hand, you could argue that many practices of the Democratic party are designed to keep people in poverty. As an example, giving people consistent welfare checks only makes them more dependent on the government and does nothing to help them out of their situation. Reform is definitely needed on both sides I’d suggest. Thanks. I think many of these things point out that we need to empathize and not turn our backs on others, but instead we should be looking out for other people.